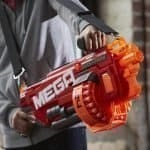 Nerf Mega guns fire darts that are larger in size so they not only hit with more impact, they can be fired at a longer distance. 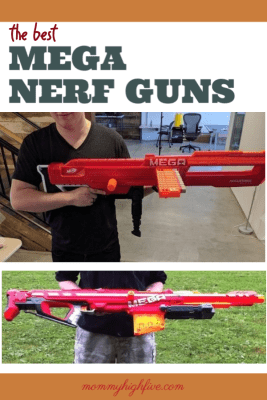 These big Nerf guns are so fun that even if some other Nerf guns may be more accurate, these definitely are worth having in your Nerf arsenal. 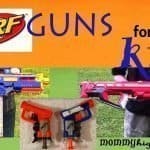 Looking for a Nerf gun for younger kids? These are not the guns for you. Ready to start a Nerf war? Then these Nerf guns that are mega will make your enemies run. Did I mention the Nerf Mega Mastodon is in this series? This gun alone make the Mega guns worth owning. How many darts the gun can fire? How cool does the gun look? Let’s be honest: half the fun is the show. How far can the Mega Nerf gun fire? How hard is it to re-load the gun? Buy extra darts or a vest kit for longer fun. 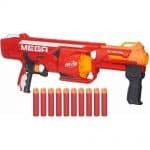 What is the Best Nerf Gun to buy in 2019? 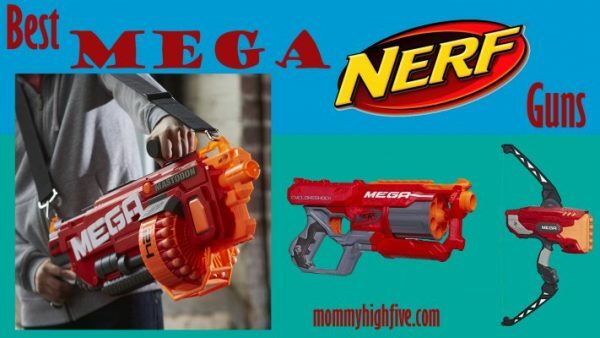 Why Use a Mega Nerf Gun? Break out the archer in you. 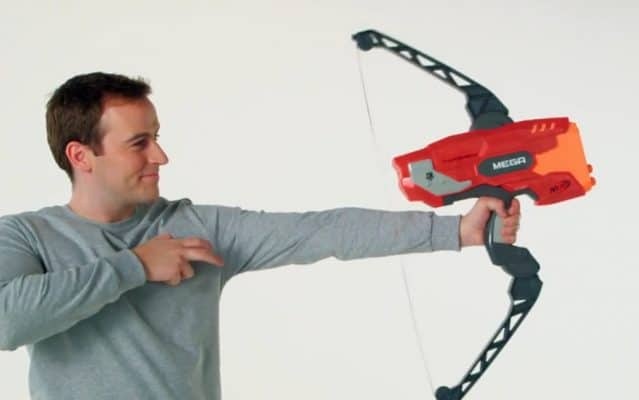 The Nerf N-Strike Mega ThunderBow ranks as the best of the best of these huge Mega Nerf guns. This bow is a whirlwind of fun. It combines a great firing mechanism with Mega darts. The ThunderBow is also one of the most functional weapons in this group, loading 5 Mega darts. This Mega bow fires up to 100 feet (32 meters). It comes with 10 darts rather than the 5 you would expect with a 5 shot weapon. This is a great Nerf gun for ages 10 and up. It can be modified to fire without the bow mechanism. If you were to design a Nerf gun in your mind, this would probably check most of your boxes. It is just a ludicrous combination of cool and function. 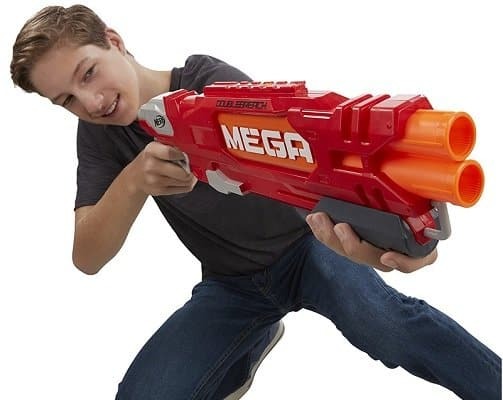 It can not only fire long shots at 100 feet (32 meters), but it is also one of the only battery powered automatic Nerf guns, and it fires a larger or Mega Nerf dart. This is a great gun for ages 13 and up. With its flywheel action, you are truly ready to make everyone around you run. 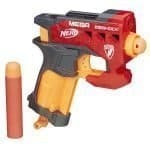 This is our runner up for best Mega Nerf gun. Because it is heavy, the Mega Mastodon has a sling that can be used with it. Really, it is necessary if you are carrying it around. I don’t know how you can fire this and not smile. It fires 24 rounds fully automatically. This is definitely one of the most powerful and biggest Nerf guns ever made. This Mega Nerf Gun is simple yet successful. 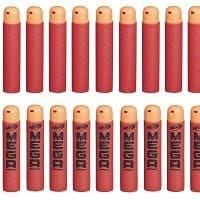 The Mega Cyclone Shooter Blaster holds 6 of the larger Mega Nerf darts at once and can fire up to 90 feet (27 meters). This gun is similar to a few others that Nerf makes, but the larger darts allow the gun to fire farther. This is your core arsenal in the Mega Nerf Gun series. None of these Mega guns are better to use in a battle than this one. With a tactical rail on the top, optics or add-ons can be used with this gun. I’d say this gun is safe to use for ages 6 or older. This is the best of the small Mega guns. 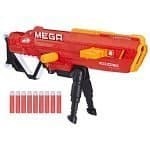 The Mega Cyclone Shooter Blaster is available in multiple colors, including the camo outsider model. 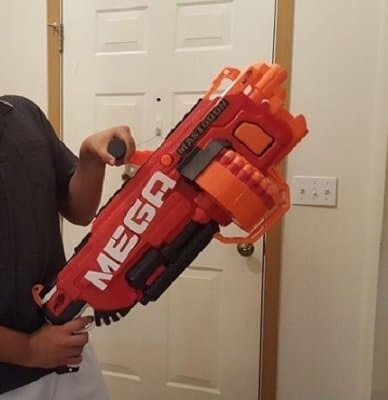 When you pull out the Nerf Mega Twinshock in a Nerf war, those around you are going to run away. This gun is truly intimidating with its huge size and ability to fire a ton of shots in a short amount of time. It is the Mega version of the Roughcut gun, but is much better. This gun can fire up to 85 feet (26 meters) and can fire with 3 different shooting options–1, 2, and slam-fire. The slam-fire action shoots 2 Mega darts at once. The massive Twinshock fires with a natural pump motion that is perfect for older kids and adults. It is a front loading gun and very smooth to prime to shoot. The Twinshock uses a two-stage trigger that allows the user to switch firing modes. Good gun for ages 8 and up. If you are looking for a semi-automatic Mega Nerf gun, then this is a great gun for you. The Nerf Mega Series RotoFury will leave your opponents running for cover. The RotoFury can fire 10 darts in a one-at-a-time fashion, or you can let loose on your enemies with a slam-shot fire of 10 darts. Mechanically, it pumps in order to prepare to fire. This gun is a lot of fun for boys or girls 10 or older. These two Nerf Mega Series Magnus Blaster options are simple yet extremely powerful. I love the grip on this gun. Sometimes guns can be hard for adults or teens to grab, but this is easy. There is a hole at the bottom of the grip to allow this to be easily hung up on a wall. 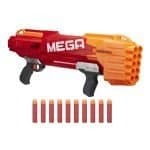 The Magnus Blaster fires whistling Mega bullets that launch up to 85 feet to surprise your unexpected enemies. This gun holds up to 3 Mega darts at once with a great internal clip. It has a simple top-loading clip that makes it easy to re-load one handed. This gun is perfect or adults down to as young as probably 8. 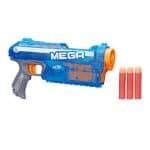 The Mega Magnus Blaster comes in 2 different colors–blue and red. The blue Magnus Blaster is a little more expensive but definitely looks better. It would be great for anyone 8 or older. Look at the size of this Mega Nerf Gun. The Nerf Mega Thunderhawk Combat Blaster is Humongous. No wonder this Mega gun is called Thunder. The Thunderhawk looks like a World War II machine gun. 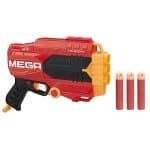 This Nerf gun is the longest Mega Blaster and comes with not just Mega bullets, but also with Accustrike Mega Bullets. This makes the gun more accurate than the Mega guns. The Thunderhawk Combat Blaster comes with a foldable tripod to help you to precisely rain down darts on your opponents. The 10 bullet clip quickly unloads. With a gun this fun, your teen or tween will get off their phone and get outside for some exercise. The Thunderhawk Combat blaster is a better looking gun than performing. However, it is still one of the best of the big guns. Although it has as a huge extension on it, it performs much better without it extended. Want to hit your enemies from a distance with a precision strike? This Mega Nerf gun is the answer. 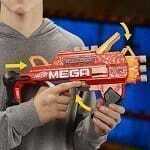 The Centurion Blaster can shoot up to 100 feet (32 meters) with Mega Nerf darts. It is a huge Nerf gun at over 3 feet long. Although the Centurion Blaster is super fun, it is definitely more looks than action. 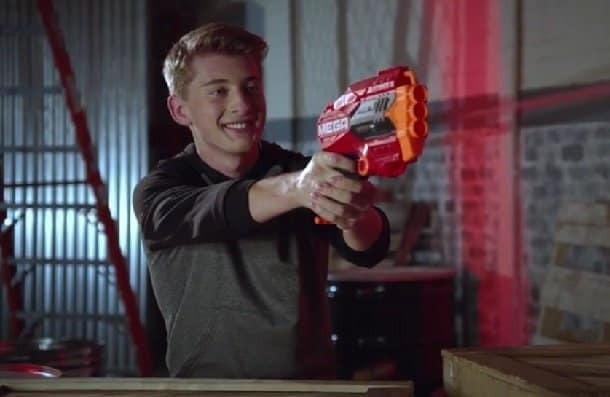 This Nerf gun is probably best for teens and adults. My 13-year-old son loves to fire this gun. 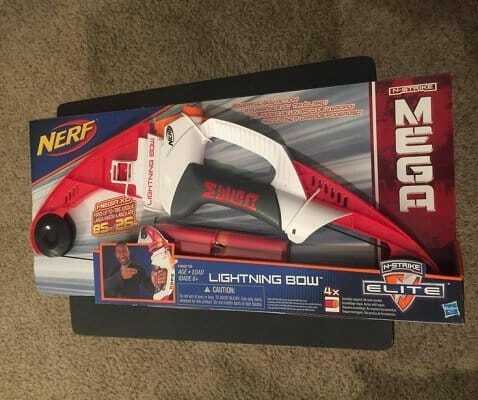 This is another great Mega Nerf Bow. 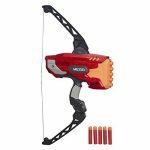 The Mega Nerf Lightning Bow fires Mega darts up to 85 feet. It has a pullback mechanism that allows for one dart to be fired at a time. This bow has a great built-in sight that adds accuracy to its fun. 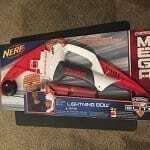 Although the Mega Nerf Lighning Bow is fun, I definitely enjoy it less than the Nerf Mega Thunderbow up above. It is much less expensive to buy and still great to chase down friends and family with. This Nerf Mega shotgun and Breach style gun is tons of fun for all ages. It would be easy to imagine fighting zombies or your siblings in the backyard with this double-barreled shot gun. This gun can fire up to 90 feet (27 meters) with each shot. 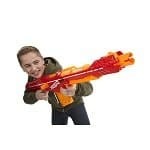 Adults would enjoy the look and feel of this large Nerf gun with convenient grips. This gun, like all of the Nerf Mega series, can shoot the larger Mega darts. These darts are exciting because they also whistle as they go by. This has a similar mechanism to a Nerf Super Soaker in that you slide back in order to prime the gun to fire. It has a slam fire blaster but with only two shots, it does not help as much as some of the bigger guns. It is great for ages 10 and up. 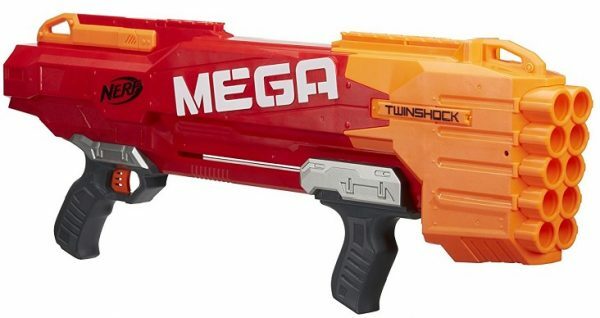 The Mega Tri-Break gun seems like a normal Nerf gun, but it is loads of fun. With its pivoting body for reloading and 3-shot load, this Nerf gun is perfect for those 8 or over. The gun is prepped by pulling the T-style handle at the bottom of the gun. The gun only has to be primed one time in order to fire the three darts one after another. The pivoting load mechanism can be temperamental. There are definitely some better Mega Guns than this one. 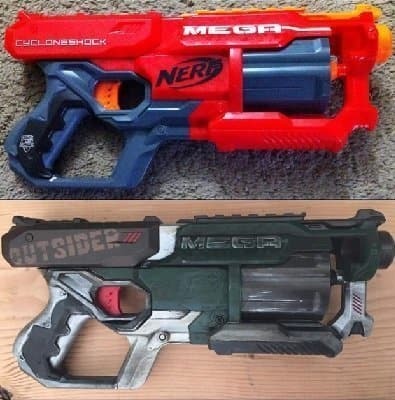 Want a simple Nerf gun that still fires Mega darts? 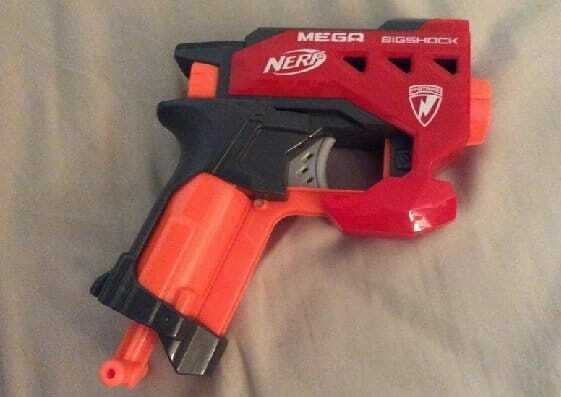 At about $10, the budget N-Strike Mega Bigshock Blaster is the answer you are looking for. The Bigshock Blaster is also a great gun as a spare when you are running out of ammo with your main gun. Weighing less than a pound, it is easy to store this gun in a pocket or holster it and run around chasing others. It can also be modified to hold Rival Nerf Bullets. 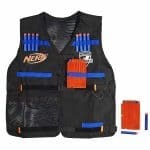 What Nerf Darts are best with Mega Nerf Guns? 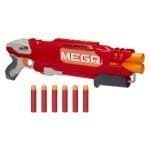 If you buy a Nerf Mega Gun you need some Nerf accessories and some extra ammo to go with it. Here are some good options to go with. 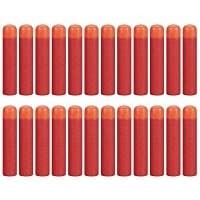 There are some variations in quality between a Nerf official dart and some of the off brand, but you oftentimes get a lot more bang for your buck on ammo.